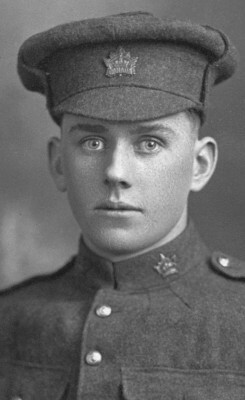 Charles Fred Mc­Kenzie was born Sept. 16, 1898, a son of Margaret (Munro) and William D. McKenzie of near Embro. He was an unmarried cheese-maker when he enlisted. He served under Dr. Donald Sutherland and was decorated for bravery. He celebrated his 16th birthday in the trenches in France, having lied about his age to join. After the war he moved to the United States where he became an American citizen.